"When you were born you were given a name and a pronoun, probably he or she. On the inside, you may not feel like he or she at all, maybe they feels the most free, or you may feel like both she and he. 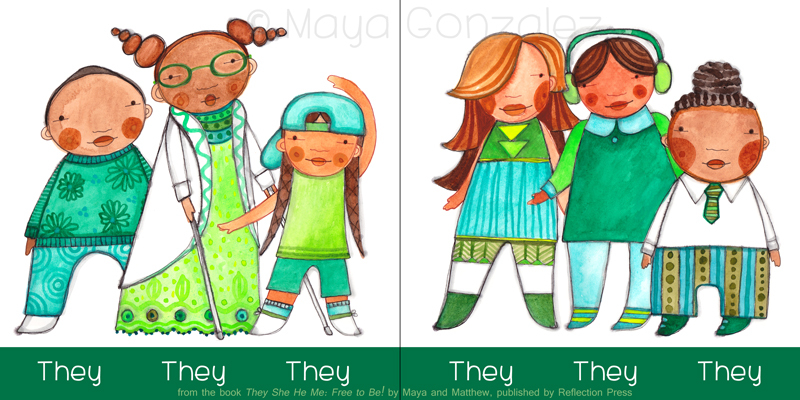 But mostly you probably just feel like yourself..."
Pronouns are a way of extending your gender out into the world. They can be used to bring your true self into greater focus, or maintain fluidity. They can also be used to maintain safety and privacy. 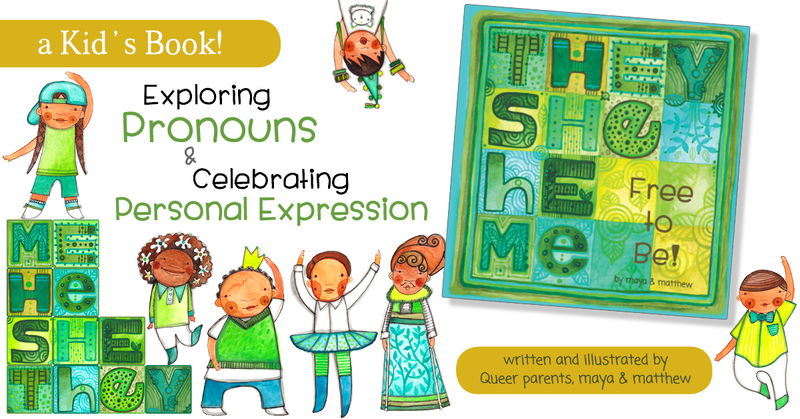 By beginning early and sharing age appropriate books that help kids see through gender assumptions, gender expansive kids can relax and trust that they are perfectly natural and valuable. And kids who are cisgender can know that they are part of a larger picture of natural diversity. This sets the stage for more learning about diversity and inclusion as they develop and helps dismantle gender based bullying before it begins. 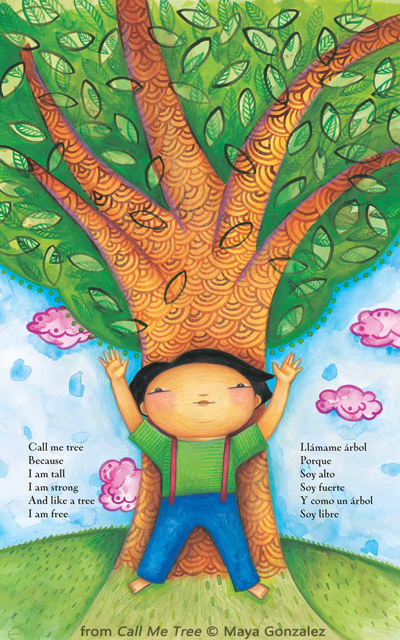 View Maya Gonzalez reading Call Me Tree and They She He Me along with a sneak peek of her newest book They, She, He easy as ABC . 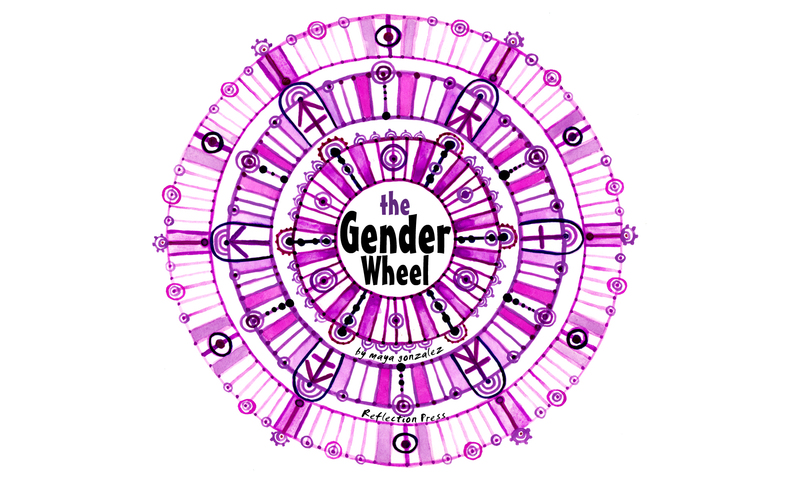 A perfect companion to The Gender Wheel, They She He Me: Free to Be! 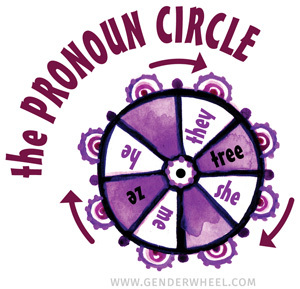 Check it out if you want to play with pronouns! You may see some familiar faces. shows many gender presentations under each pronoun and invites even more. 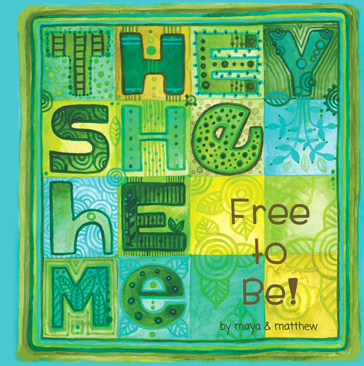 Includes 47 different kids and their pronouns. 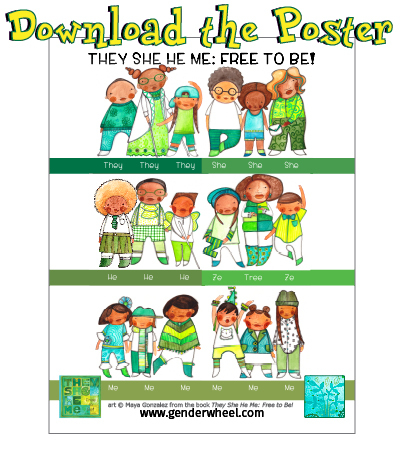 Keep inclusive perspectives alive with a poster! 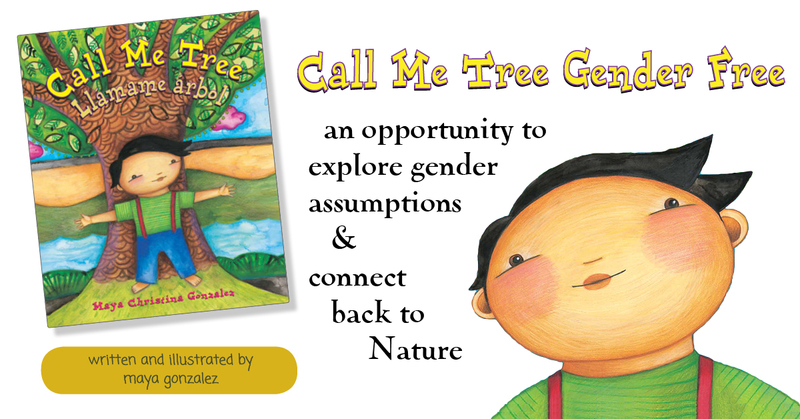 By being intentionally gender free, Call Me Tree provides for some a much needed break from the constant boy-girl assumptions and requirements. It can also provide a moment to pause and consider those assumptions, requirements and their impact. Download the in-depth Reader's Guide created by Maya. intentionally created without pronouns and main character is referred to as a kid not a boy or a girl. Despite the fact that there are no gender specific pronouns, reviewers have assumed the main character is a cisgender boy. The main character is actually based on someone assigned girl. The specificity doesn’t matter as much as the opportunity to notice the assumption. Many of us assume a child with short hair, dressed in a t-shirt and pants is a cisgender boy. What does an assumption like that fully communicate? About gender requirements? fitting in? living up to expectations? being accepted? Who does it leave out and what is the impact of being excluded? Become aware of gender assumptions and stereotypes and step away from "guessing" people's pronouns and gender based on stereotypes. 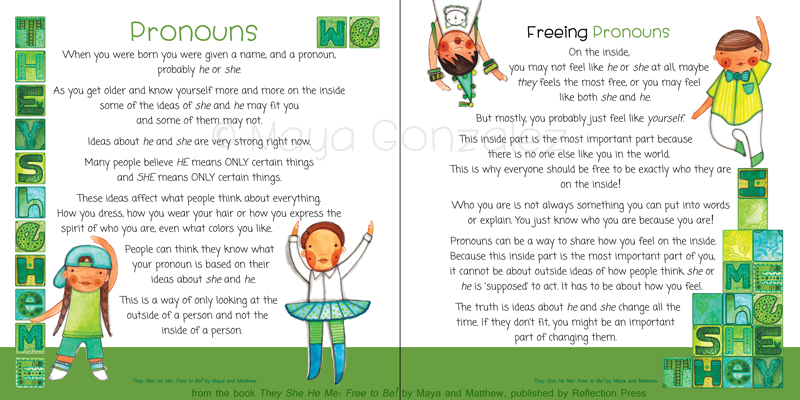 Through the letter to readers kids understand that guessing about someone's gender based on how they look can leave a lot of people out. When we introduce that the main character would have been assigned girl at birth, we can ask how does knowing this change their understanding of the other kids in the book? What if we imagined all the kids in the book went by she? What if they all went by he? or they? or tree!? Explore international, multicultural perspectives on gender beyond western ones. 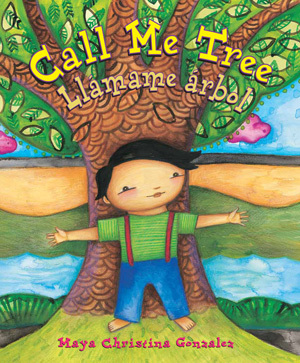 The book begins with nature, then connects the kids to their bodies through Yoga, specifically the Tree pose and variations thereof. This provides an opportunity to learn about Yoga and India. We can learn that India has a legal third gender. 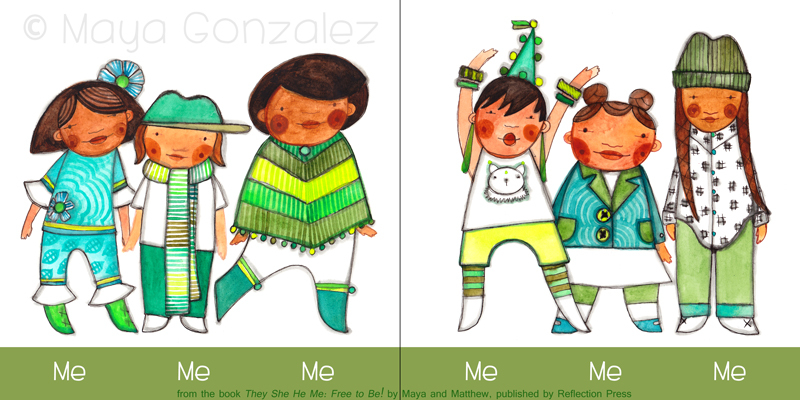 We can then reflect back on the book and explore the kids’ genders. Gender Series Part 2: Multicultural Awareness provides resources and videos for educators to gain more understanding of gender in other cultures. Also included are coloring pages and book recommendations to share with kids.